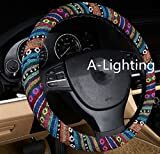 A-Lighting Ethnic Style Coarse Flax Cloth Automotive Steering Wheel Cover Anti Slip and Sweat Absorption Auto Car Wrap Cover - A ?Material upgrade, prices unchanged? / A-Lighting Ethnic Style Coarse Flax Cloth Automotive Steering Wheel Cover Anti Slip and Sweat Absorption Auto Car Wrap Cover – A ?Material upgrade, prices unchanged? A-Lighting Ethnic Style Coarse Flax Cloth Automotive Steering Wheel Cover Anti Slip and Sweat Absorption Auto Car Wrap Cover – A ?Material upgrade, prices unchanged? Unlike the average rubber ring steering wheel cover,can easily installs to most standard steering wheels in just minutes, while creating a virtually odor-free driving experience. Coarse cloth flax, protecting your hands from hot or cold steering wheels. good anti slip sweat absorption function. New steering wheel cover,install feel small because the steering wheel cover installation is very tight,let the steering wheel cover is fixed at the top, the steering wheel really play a security role. If Its difficult to put it on at first time, because it has kind of hard rubber coating inside , you can heat it up a little under the sun to soften the rubber then put it while its warm. Its easier to stretch it a little. About customer serverce: your unique and valuble suggetion is the most helpful way to make this item you love become more and more bette,so free to contact us, come on! There are many cheap imitation of our products recently,ONLY “A-Lighting” Brand is the truly brand to promise the quality. Please measure your car’s steering wheel diameter( suitable for 14.5″) if your steering wheel cover is not common or you not sure this size, please contact us before you buy it. Pretty beautiful and high performance steering wheel cover, these color will bring vitality for your car. never disappointment.